From Lauren: This recipe is a contribution from Michelle, who shares an autoimmune-friendly recipe each month. We could all use more recipes for easy weeknight meals! Recipes that get in vegetables, healthy fats, proteins, and tons of flavor are always welcome in my kitchen. 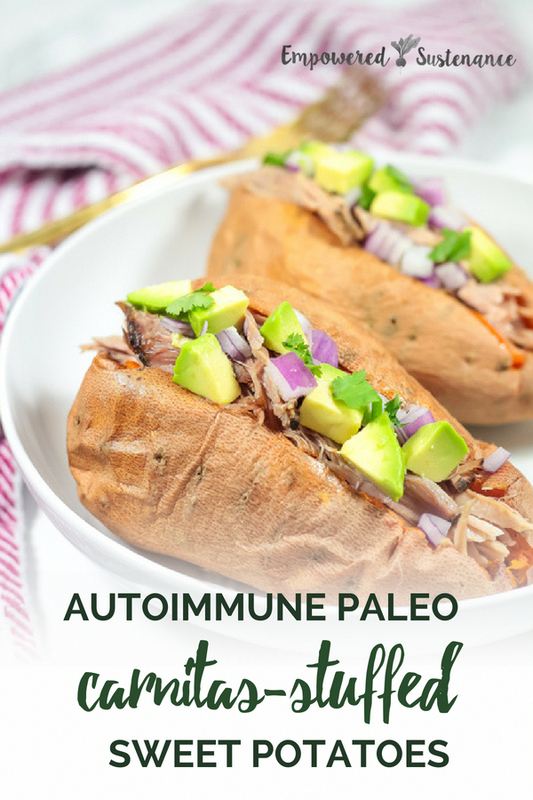 These autoimmune paleo friendly carnitas stuffed sweet potatoes are perfect for adding to your weeknight rotation. I know what you’re thinking… how do you make Mexican food AIP? Nightshades, dairy, corn, and mystery oils are in the majority of dishes you’d find at just any chain Mexican restaurant, making it them a serious danger zone for anyone on an autoimmune paleo diet. 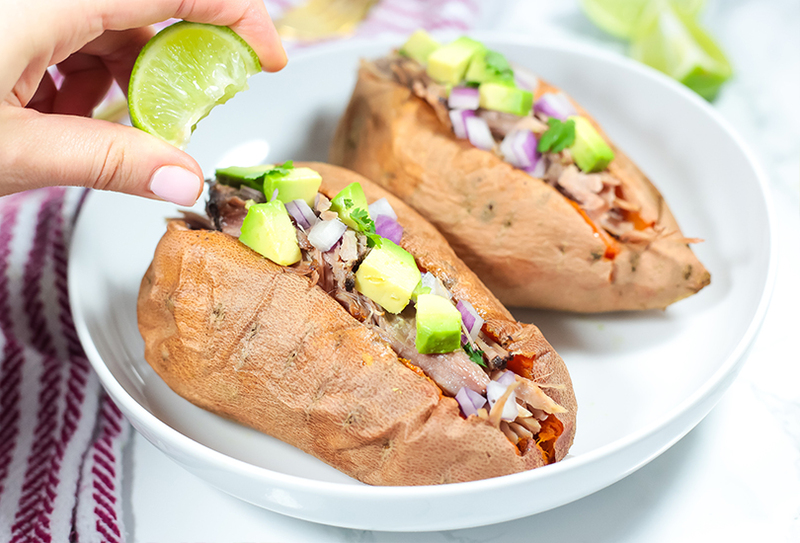 However, these carnitas stuffed sweet potatoes are the exception to the rule. Pork shoulder- A great cut of pork for making carnitas. I always buy mine at my local farmers market, but you can easily find this at a butcher counter as well. Orange, white onion, garlic and lime- These help flavor the carnitas while in the slow cooker. Sweet potato- The amount of sweet potatoes you use will vary depending on the amount of carnitas you have, and how many people you’re serving. I made 4 sweet potatoes to serve for my husband and I to have over two different meals, and then saved some of the leftover carnitas for later! I recommend using Lauren’s technique for baking the perfect sweet potato. Avocado, red onion, and fresh cilantro- The toppings for the finished meal. For the carnitas, place the pork shoulder in a slow cooker and season with salt and pepper on both sides. Add the lime juice, orange juice, onion, cilantro and garlic to the slow cooker and cook the carnitas on low for 8 hours. After 8 hours, remove the pork shoulder from the slow cooker and shred with two forks. Set the carnitas aside. For the sweet potatoes, use Lauren's method here to baking the perfect sweet potatoes. To assemble, stuff the sweet potatoes with the carnitas (save any leftover carnitas for later) and layer on the avocado, red onion, and fresh cilantro. Serve with fresh lime on the side and enjoy!